You just got engaged! Or you've been engaged for a while but are finally sitting down to plan this party. Or maybe you haven't made anything exactly official yet, but you know you want to spend your lives together. Whichever it is, when you're ready to take a deep breath and start planning, this is the book you want-need-to have. 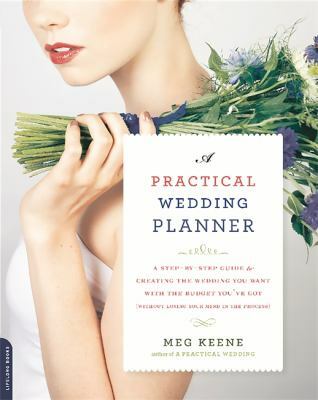 Meg Keene has put together the (practical) companion to A Practical Wedding: smart, clear, focused guidance-with a hefty dose of reassurance-to help you plan your big day. From figuring out what you really want-as opposed to what everyone else thinks you should want-to helping you keep an eye on the ceremony itself and the vows (a.k.a. why you're throwing this party in the first place), Meg helps you cover all the essentials: Setting a budget-and sticking to it, Choosing a venue: traditional, non-traditional, and everything in between, Catering, rentals, and everything else Pinterest forgot to tell you, Wedding decor: a realist's guide, Creating and writing a ceremony, Getting everyone to show up... and have a good time. With checklists (such as flowers, food, final venue walk-through) and key spreadsheets (guest list and seating chart, budget, venue search, and more), Meg helps you plan a wedding that will leave you feeling joyful, not emotionally exhausted and broke. Book jacket. New (134 available) BRAND NEW. Over 1.5 million happy customers. 100% money-back guarantee. Make your purchase count: support Better World Books' worldwide literacy partners.